From 1950 souvenir booklet . . . Chances are, when you see Vaughn Monroe on stage or on a ballroom bandstand these days, you'll see him surrounded not only by four good looking gals, but the same number of good looking guys. They're the Moonmen, and they're Vaughn's newest addition to his growing, traveling, record-breaking organization. Their names are Johnny West, Walter Olsen, Bill Mustard and Nace Bernert. After watching the success of the Moon maids on so many of his record hits, Vaughn decided in 1948 to augment his vocal section still further. This, particularly in view of the number of western discs they were cutting which seemed to call for fuller voicings than the regular pop ballad arrangement. Thus, the Moonmen were born, and in combination with the Moonmaids, the vocal color and range in back of Vaughn on many recent records has taken on the depth and power of a full choir. Walter Olsen, first tenor, is Brooklyn born, and started singing as a church choir boy. His career took quite a classical turn before he joined Vaughn in 1948. At 20, he was a member of the Metropolitan Opera chorus, and later the Fred Waring Glee Club for nine months. At 25, he joined the Columbia Opera Company and in 1945, the St. Louis Opera chorus singing second roles. Later he had his own radio show on station WABI in Bangor, Maine. He likes to swim and sail, and he is the father of two girls and a boy. Johnny West, the second tenor, has been with Monroe since 1941, but until last year his role was confined strictly to the reed section as baritone sax man. Johnny is a native of Boston, and comes from a show business background. His mother and father were a successful song and dance team before Johnny's time. As a result, Johnny started in the business early. He began to sing at 10, and has since appeared in many amateur and professional musicals. His career as a reed many started at 17, when he played with Benny Goodman for some time before joining Monroe. Johnny is married and has two boys. He names swimming as his only hobby. Bass man, Nace Bernert was born in Hungary. He came to America at the age of two, later attending La Salle College in Philadelphia, his home town in the States. Nace also was a choir boy at 10. He began singing professionally with the Philadelphia Grand Opera Co., and later as a member of the Four Showmen Quartet at station WCAU in Philadelphia. A period with the Ray Bloch choir in New York preceded his entrance into the Monroe unit, when the Moonmen were first organized. Nace's main offstage kicks come from the fun he gets coaching teen-age football teams. Bill Mustard is the baritone of the group. He has been a trombone mainstay of the band since 1946. When Vaughn was looking for baritone talent for the new quartet Bill was it. He was born in Utica, New York. His parents hail from Glasgow, Scotland, where his father was considered quite expert on the bagpipes. Bill himself has been playing trombone since the age of 10, and during his college years at Cornell, was a member of the Cornell band. His professional career started with Charlie Spivak in 1940. A year later he switched to Teddy Powell and in 1943, to Horace Heidt. It was with the latter band that he first got a chance to use his voice, From 1944 to 1946 he saw Army service, and on his discharge went with the Gene Krupa band until joining Vaughn. Bill is serious about jazz. He is a follower and collector of bop records. The remainder of his spare time is spent as outfielder on the band's ball team. From 1950s souvenir booklet . . .
Maury Laws, a young gent from Burlington, N. C., finally persuaded Dee to marry him on April 30, 1952. Originally, Maury played guitar with various bands. After a three-year hitch in the army during World War II, he sang with and wrote arrangements for a number of singing groups. As a free lance singer, he appeared on practically every top radio and TV show, including "The Telephone Hour," "Toast Of The Town," "The Arthur Murray Show," and with Ken Murray, Kate Smith, Jimmy Durante, Fred Allen, Ed Wynn, Jack Carson and Danny Thomas. 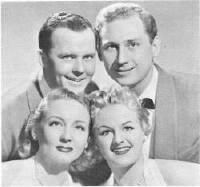 Maury studied music for three years with Tom Timothy in New York, and has arranged music for many top entertainers, among them Betty Hutton. He has orchestrated for the palace Theater bandsmen in New York, and his ambition and goal is to compose serious modern music. Please see the Maury Laws website http://www.maurylaws.com for current information. The fourth member of Vaughn's new group is 25-year-old Kevin Gavin from Los Angeles, where he sang with the famous Robert Mitchell Boys Choir, appearing in many movies. Kevin received a music scholarship at Loyola University in LA, and majored in English. Following college he became a member of the "Salute To Gershwin Show," which played leading West Coast theaters and hotels, and in 1950 joined the "Ken Murray Show," with which he came to New York. After two years with Murray, Kevin went into free lance work and appeared on the Kate Smith and Jackie Gleason shows, among others. Keenly interested in short-story writing and song writing, Kevin has taken several summer writing courses at Columbia University.